Treat yourself to one of our holistic treatments! Relaxing Massage: Progressive and firm techniques with the goal of releasing physical and mental tensions. Swedish: Variety of relaxing techniques with soft and wide strokes. The benefits of this massage include circulation improvement and muscular detox. Reiki: The power of this technique helps freeing the unbalance energy of the physical, mental, emotional and spiritual body. Deep Tissue: Therapy type with a firm, manipulative practice that uses pressure and movement to release deep layers of tissue, including tendons and fascia (the protective layer surrounding muscles, bones and joints). Shiatsu: Form of Japanese body work techniques that include massages with fingers, thumbs, feet and palms. Assisted stretching, joint manipulation and mobilization. 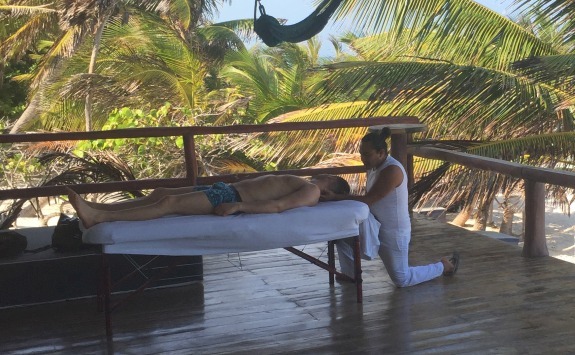 Mayan Healing: Ancestral incredible healing massage developed by the Mayan ancestors. The techniques focus on the belly area recognized as the center of power. Facial and exfoliating body scrub: light corporal massage with natural exfoliation and body wrap such as coffee, clay, chocolate, mud, honey, papaya or Aloe Vera. All massages are offered on a 60 or 90 minutes session.